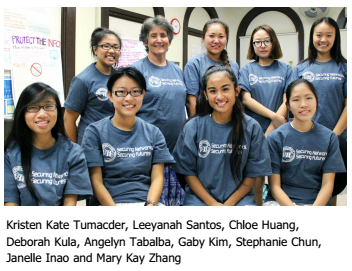 Led by Coach Deborah Kula, the team of students from Sacred Hearts Academy excelled in the CyberPatriot VII State Round held December 5-7, demonstrating teamwork, critical thinking skills, and technical knowledge key to a successful career in cybersecurity. The team’s performance earned it a spot in the Gold Tier Regional Round to be held January 16-18, 2015. Following the Regional/Category Round and Middle School Division Semifinals Round January 16-18, top teams in the Open and All Service Divisions’ Platinum Tier and the top three Middle School Division teams nationally will advance to the CyberPatriot VII Finals Competition in Washington, D.C. In all, 2,175 teams registered to compete in CyberPatriot VII, including 35 teams from Hawaii. CyberPatriot’s core program – the National Youth Cyber Defense Competition – challenges teams of two to six students across the United States, Canada, and from DoDD schools abroad, to find and resolve cybersecurity vulnerabilities in simulated environments. Top teams from the preliminary online rounds win an all-expenses-paid trip to Washington, D.C. for the live National Finals Competition, where students compete for national recognition and scholarships. The CyberPatriot field is divided into three divisions – the Open Division for public, private, and home school teams, the All Service Division for JROTC, Civil Air Patrol, and Naval Sea Cadet Corps teams, and the Middle School Division. Based on the results of two preliminary rounds, CyberPatriot VII high school teams were categorized within their divisions as Platinum, Gold, or Silver Tier teams, with Platinum Tier teams representing the highest scoring teams.